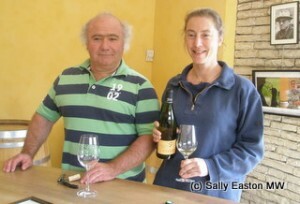 Nathalie and Gilles Fevre make outstanding wines from their 43 hectare Chablis property. As well as a sizeable chunk of straight Chablis, they have parcels in Grand Cru Les Preuses, 1er Cru Vaulorent, 1er Cru Mont-de-Milieu and 1er Cru Fourchaume. In order to concentrate on what they do best, about a third of their production is sold to La Chablisienne co-operative, where Nathalie used to be the winemaker. Shiny stainless steel and just a few oak barrels adorn their winery. I was keen to get the low-down on Chablis and minerality from these top-quality guys. Gilles defined minerality as “the impression of having limestone in your mouth, a chalky texture, salty in the mouth, it reminds you of the seaside.” Licking and munching on vineyard stones has become something of an occupational hazard for me. No conclusions as yet. Mineral expression was also cited as being vintage related, as Nathalie explained: “in 2007, because of the hail the Mont de Milieu parcel was partly destroyed. We picked only half the grapes, part ripe, part black. But we noticed the wine was very concentrated, a bit too heavy and fat, not with the usual typicity. “It was the same in 2008. Then three years afterwards, in 2010, Mont de Milieu became mineral again. It’s now showing back with minerality.“ The Mont de Milieu 2010 was my favourite wine of the tasting here. Time in bottle was also discussed, with something about minerality taking time to develop, for example it was yet to appear, according to the Fevres, at the time of tasting, on the straight Chablis 2011. Gentle, floral, hints of metallic steeliness, deep intensity of flavour, mealy savouriness. Very smooth and textured. Light and lively on the tongue, fresh and moreish. Hints of aromatic peaches, with a steely note, dark and a bit brooding in bass texture – really intriguing and enticing. More back palate intensity, smooth and almost slippery (positive) texture. Vg. Elusive nose, then peachy and apricot. Palate with galvanised steel, intense, smooth, sophisticated. Huge concentration, in a non-fruity spectrum. Citrus pith and little more than the memory of toastiness. Creamy attack, meal and white nuts, notes of floral mid palate, with hint of vanilla spiciness mid palate. Salty twist at the back palate. Lively on the tongue. Lovely concentration again, warm and a bit embracing. Smooth texture, with restraint that appears bursting to get out. Long mineral salty tang bang in the middle of the tongue on the sides. Tingly acidity, mouthwatering. Vg. 2009 was sunny and hot – a low malic acid year. Non fruity nose, gentle, soft white flowers come through, fresh white nuts, and white pepper note on the palate attack. Rounder feel on the mid palate. Warm, almost; less linear though still a penetrating palate. Like this less than the 2010, but that’s just stylistic preference. Both very good. 2008: very cold, classic, acidity stayed in grapes. High acid vintage. Aromatic wafting smoke on the immediate nose. Richness and fatness of palate attack. Full bodied and richness of mealiness. Nonetheless seems to miss the focus and perspicacity of 2010 vintage. Preuses is harvested earlier than the others, which may explain this less weight. Mealy nose, floral too. Fresh, steely note mid palate which keeps the mid-palate sucked in. Clearly needs more time to fill out and soften a bit. Huge wine. My research visit to Chablis was sponsored by the Chablis commission of the Burgundy wine board.